There was sufficient good weather in October and November to enable the exterior Hall renovation project to be completed within the tender time schedule; a tight window between the departure of our colony of migratory house-martins and swifts and the arrival of winter weather. Rotten wood work has been replaced, all exterior painting done and the smart, long-lasting Lindab guttering and drainage system installed (this was more expensive than the plastic equivalent but has a very much longer life-span). So our grateful thanks go to the team from Churchill’s the Builders for a job well done. We plan to complement the new smart image of the Hall with an autumn “spring-clean”. We will tackle the interior on Saturday 30 November starting at 10.30am and the outside area on Sunday 1 December starting at the same time. Some of the Clayhidon Friends have offered to join the committee in this project; we are extremely grateful for the support of any volunteers. Our renovation “must do” tasks do not stop there. Next on the job-list agenda will be the repointing of stonework and brickwork of the building. Then, as and when we can raise enough money to afford it, we will tackle the renovation of the walls surrounding the car park. We’ve had a number of enjoyable and really successful events this autumn and have been very gratified by both the high level of support and enthusiastic feedback of our audiences. They sing of prison, railroads and crimes of passion. They sound for all the world like a bunch of good ol’ boys singing their hearts out in the Appalachian Mountains. Next, in November, was Hickman & Cassidy 's great night out. We were treated to a very stylish performance from this talented duo who played a rich variety of music complemented by a commentary of amusing anecdotes and illuminating stories. Then came the Parish Quiz on Friday 15th November. It was great to see a good turnout of 10 teams from Clayhidon and surrounding areas at the recent quiz. There were many familiar contestants and a lot of newcomers too; so it was very pleasing that the atmosphere was so jolly - great camaraderie between the teams and new friendships forged. This year’s Brains of Clayhidon 2013 are The Rockies. Julie and Stephen Bullett from Graddage joined forces with John and Barbara Long from Rosemary Lane to become the champions,” beating long established teams by a country mile. As always we are truly indebted to Peter Walter, our quizmaster, who produces a challenging assortment of questions and keeps order with such kindly good humour that you almost wish you could go back in time to be a pupil in the school where he taught. And thanks go too to Judith Ward, his “charming assistant”, who cheerily (and accurately) does all the sums. This event also raised a great sum of £199 for Hall Funds. Thanks to the fantastic audience support that we have received from the community, the generous donations from folk in cash and kind and the hard work of all the Hall Committee members it is really pleasing to report that in this financial year we have joined forces to raise the grand sum of £3076.61. So a big thank you goes to all those who have played their part in this success. BEE HILL WRITES: the Hall’s swifts and house martins have now departed along with the glorious summer when most of us spent much of our free time outdoors enjoying the sunshine. Autumn is now upon us and it is the task of the Hall Trustees to ensure that the building is thoroughly weather-tight and well protected. We went out to tender and have commissioned remedial work to the exterior of the Hall to replace rotten woodwork and slipped tiles, repaint exposed surfaces and install high spec “Lindab” prefinished metal guttering and drainpipes - warranty 15yrs and life expectancy up to 100yrs – so that should see us all out! Weather permitting work should start soon. There will be scaffolding in place for part of the work but we aim to minimise any inconvenience to Hall users. We are very pleased to have been able to book this freelance gig. Some of us heard this duo at Appley Pavilion last year, performing there for the second consecutive year as they were so well received. We knew that Clayhidon audiences would appreciate them and just wouldn’t want to miss out. Hickman’s emotive, soaring vocals and driving guitar is complemented by Cassidy’s ingenious and virtuosic fiddling (for those in the know, he is the brother of the late Eva Cassidy, singer/songwriter, and so had music running through his veins from childhood). Their sound flows from the connection between British and American folk and swing and is bursting with all the humour, heartbreak and excitement of these genres. The lively English wit of Hickman is set against Cassidy’s bone-dry irony and American drawl as they take audiences on a dynamic and unforgettable transatlantic journey. See their website http://www.hickmanandcassidy.co.uk, & our Pump advert for prices. This is your chance for a brain-teasing workout, pitting your wits against other teams in good-spirited competition. Teams of up to 4 members can book their places Contact Caroline Bendle Tel: 01823 681 047. There will be a charge of £3 a head which includes home-prepared interval refreshments. Bring your own bottle if you would like to drink alcohol. On Wednesday 12th February we have music from Ben and Alfie – two young classically trained musicians who have travelled widely, spending time in Senegal and expanded their repertoire so that it now includes traditional folk as well as Jazz, Classical, West African and South American influences. We heard them play at the V in A menu launch and were enchanted by their lyrical music, delightful stories and warm personalities. On April 4th April we’re really lucky to have secured The Old Dance School – a fantastic 7 piece band championed by Radio 2’s Bob Harris. We are told that their live show leaves audiences breathless! So we hope that there will be something of interest for everyone on this the 50th anniversary of the Hall’s creation. We have be thankful to the Hall’s founding fathers, Billie Bendle, Clarence Kallaway, and the Rev. Hope, who had the imagination and foresight to purchase the old school as a resource for all the community of Clayhidon and its immediate environs. We will do our best to keep that mission alive and working well for you. - Bee Hill on behalf of the Hall Committee. This will be the fourth time that the masterful banjo player, Leon has come to Clayhidon, each time with a different ensemble, every gig selling out and completely wowing the audience. The star-studded line-up is: Leon on 5-string banjo; Jason Titley - UK’s finest Bluegrass guitarist; the burning mandolin player, Joe Hymas and multi-instrumentalist Ben Somers – vocals and double bass. With several CDs to his name already, Leon and the n’Tets recently launched their new album to great acclaim. You can see the band’s website: http://www.leonhuntntet.com and listen to some of their music. But don’t put off ordering your tickets for too long, they are selling like hot cakes! It is important to ring or email me to check availability and to place your order. Payment in advance can be made for both tickets and refreshments by cheque made payable to Barbara Hill and sent to me at Bollhayes Park, Clayhidon, Cullompton EX15 3PN. Please include an SAE for ticket return. It’s probably a good thing that we don’t arrange any exciting goings-on at the Hall in the summer months. No doubt anyone with any sense will be either down at the seaside or enjoying the shade of their gardens in what seems to be our first summer for a long while. Let’s just hope the sunshine lasts into the school holidays and that we have the occasional reviving rain shower over night to refresh gardens and water farmers crops! Our entertainment season will start again in September although tickets will be on sale for some things from now onwards; but more of that later. Just to keep you informed; there have been some changes to the personnel of the Parish Hall Committee. Sadly, Jeremy Cogswell left us when he and Saranna moved into Trull but we are really glad that both of them are still firmly attached to village life and frequent attendees at most events. They also continue to add their support through gifts and the like so we thank them both very much for all their past help and look forward to their continuing friendship. Some new members have joined the Committee team; they are Lucy Ball, Gareth Weekes, editor of the Clayhidon website www.clayhidon.org.uk, and Ted Pitt, who has long played a very supportive, practical role at most of our events. We very much welcome their interest in the Hall and eagerly look forward to their new perspectives and ideas. They join the familiar team of Mike Hudson (chairman), Rosemary Jones (Treasurer), Caroline King (Secretary), Caroline Bendle (bookings clerk and caretaker), Alan Redwood, Sandra Aldworth, Nic Gray/Werner, Doreen Pike Thelma Blackmore and me, Bee Hill – Villages in Action promoter and now also vice-chairman. We will endeavour to do our best to keep the Hall alive and vibrant so please do approach any one of us if you have ideas about any new projects or events that you would like to happen there. Big thanks come from Caroline Bendle to all those kind folks who responded to her plea for tea towels, returned or new; she had a fantastic response and we are well-stocked for the foreseeable future. Happily, thanks to the generous grant of £1,000 allocated by our county councillor Ray Radford to support Villages in Action events in the Upper Culm Valley, our allocation of V-in-A events and the subsidy that we receive towards them remained the same last year and will do so for the forthcoming year. The rest of Mid Devon villages unfortunately will not fare as well in future as MDDC has regrettably decided to axe its support. We are offering a full programme of events for the 2013 – 2014 season, starting with couple of freelance gigs in the autumn. Following a service at St. Andrew’s Church, there will be harvest supper and entertainment at the Hall. There is always a delicious, wholesome meal and plenty of juice and cider to drink and the evening is rounded off by a jovial “home-grown” cabaret performance from some of the parish’s treasured “thespians”! Tickets for the supper are £10; these can be reserved on a 1st come 1st served basis. Contact Margaret Blackmore on Tel: 01823 680 256. Hickman’s emotive, soaring vocals and driving guitar is complemented by Cassidy’s ingenious and virtuosic fiddling (for those in the know, he is the brother of the late Eva Cassidy, singer/songwriter, and so had music running through his veins from childhood). Their sound flows from the connection between British and American folk and is bursting with all the humour, heartbreak and excitement of these genres. The lively English wit of Hickman is set against Cassidy’s bone-dry irony and American drawl as they take audiences on a dynamic and unforgettable transatlantic journey. See their website http://www.hickmanandcassidy.co.uk.tickets will be available from Bee Hill Tel: 01823 680 347 or email beehill@hotmail.co.uk nearer the time so watch this space! Season Tickets - three months duration for only £30 with unlimited sessions of 1½ hrs duration for the ticket holder & playing partner or family. Also available are single session bookings @ £7.50. Bookings are subject to availability, this should be checked with the booking clerk, Caroline Bendle; Tel: 01823 681 047. Something we hope for everyone to enjoy! On Friday 17 May a near-capacity audience at the hall was treated to a superb performance of three plays from Alan Bennett’s “Talking Heads” series. It’s a tough call to follow the likes of Maggie Smith, Stephanie Cole and Thora Hird who starred in the original plays especially commissioned by BBC T.V. But it was clear that the Clayhidon audience thought that Imogen Smith, Jenny Start and Janet Hookway, actors from the Uncommon Players theatre company, made the production their own, each bringing to life the stories and dilemmas of their characters; performances that were at times funny, poignant, very moving and always convincing. Such was the positive response to the Uncommon Players, who work in conjunction with the Northcott Theatre, that on hearing they were planning a new touring production – this time of “Educating Rita” - the audience gave a loud “Yes Please!” to the suggestion that the company should perform here again next year – we will do our best to make that happen. Not only was this show a dramatic triumph but it was successful financially; we were able to pay the company a fee of £453 and also raised in excess of £500 for hall funds – a good contribution to hall developments. A big “thank you” also goes to the hall team who provide the much appreciated hospitality to our guests and to the enthusiastic and appreciative audience who attended – they certainly made the company keen to come back! June and July are quiet months at the hall with no major new events happening. However the Country Music Club will continue to hold its monthly performances – see the Pump adverts. Badminton at the Hall: Schools are getting closer to the end of the academic year so the availability of badminton at the hall becomes increasingly appealing – a good way for a family or friends to occupy a wet day in the summer holidays. Special Deal Season Tickets for only £30 entitles you to unlimited sessions of 1½ hrs duration for the ticket holder & playing partner, family or friends for 3 months duration – it’s a bargain that you’d be hard-pressed to find elsewhere!. Single session bookings @ £7.50 can also be made. Caroline Bendle; Tel: 01823 681 047. The fabulous Leon Hunt and his new band will be returning to Clayhidon to treat us to another evening of world-class Bluegrass, Folk and Jazz music. This show is bound to be a sell-out; reservations for tickets are already being made. Have a great summer & see you all again in the autumn we hope! B. H.
It’s been a really busy, convivial and exciting time at the Parish Hall for, as well as the regular clubs and activities, recently there have been some very special events. The Big Breakfast at the beginning of March drew record crowds of folk from far and wide; clearly the Clayhidon cooks have, quite rightly, a reputation that impresses hungry customers! Efficiently organised and served by charming volunteers, the big breakfast (& it really was big, delicious and very filling) ranked as a quintessentially English “good do”! Pam Reynolds and her worthy team raised a truly impressive total of £1240 for Cancer Research – we are all very grateful to them for their efforts and commitment to such a good cause. audience. I’ve had an avalanche of appreciative feedback about the quality of Neil and Tim’s singing, the range of their repertoire, and the great feeling of well-being that the show generated – “I laughed so much that my face ached” was one of the many comments. “A wonderful show & smashing evening” was the overall verdict! They do perform several other shows so maybe one day we will have them back again. Femmes Fatales is a new show created by jazz singer Sarah Moule and her husband Simon Wallace, who by co-incidence just happens to be our own Gareth Weekes’ cousin! Sarah and her accompanist Jenny Carr wowed an enthusiastic audience with their fine musicianship, sultry songs and witty illustrative anecdotes. It was an evening of excellence that would befit a big city venue – what a privilege to be able to enjoy it in our own village hall and at such an affordable rate. Long live Villages in Action – we really appreciate what you bring to us! The two shows enabled us to earn in excess of £900 for hall funds; this will help finance imminent renovations. So we thank all those who donated raffle prizes, provided home-made refreshments and worked so hard to make both evenings a success. And above all, we thank all of you who come to support these events with such great good humour. So what’s next??? Well, in May, we are happy to present the first of this year’s freelance shows. The Uncommon Players are proud to represent to us “Talking Heads” by Alan Bennett on Friday 17th May @ 7.30pm. As the lives of three women are prised open, their joys and foibles as human beings are unwittingly revealed in this blackly comic and poignant production that reveals the truths lurking under the surface of ‘Britishness’. Audiences will enjoy an intensely personal and private tour of their lives, as the beautiful craftsmanship of Bennett’s writing sensitively navigates the recognizable ridiculousness found in the mundane and the familiar. In A BED AMONG THE LENTILS we meet Susan (Imogen Smith) a vicar’s wife for whom a taste for sherry and a dalliance with a local corner shopkeeper help alleviate the tedium. Community stalwart Muriel (Jenny Start) organizes people and events, including her own husbands’ funeral, with military precision in SOLDIERING ON. And in A CREAM CRACKER UNDER THE SETTEE we meet Doris (Janet Hookway) who is fastidiously clean and defiant about going into a home. The Uncommon Players are a Devon-based open mix of theatre artists who bring audiences high quality theatre from one of Britain’s leading dramatists – this is an opportunity not to be missed. 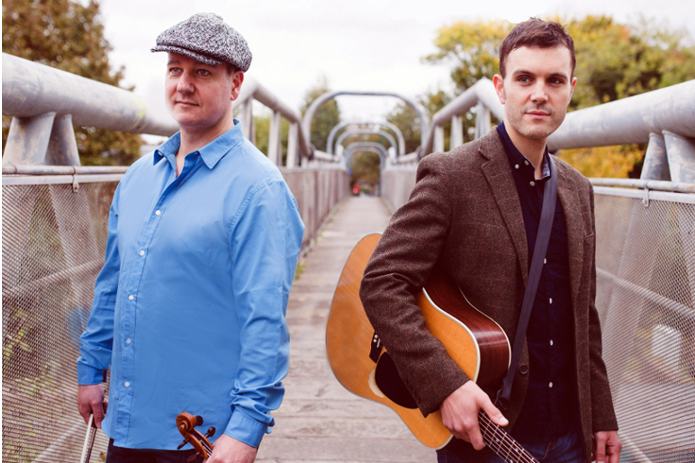 Saturday 2nd November @ 7.30pm - James Hickman (guitar & vocals) & Dan Cassidy (violin) play Celtic Folk and Swing. A transatlantic duo inspired by the music traditions of America & Britain. There has been a migration of tea towels from the Parish Hall. for their return as there is now a desperate shortage at the Hall. Or if any kind souls have tea towels that are surplus to their requirements she would happily accept donations. These can be left either at the hall or at her home, Dippers Halt, at the bottom of Battle Street. BEE HILL WRITES: Happy New Year to you all – here’s hoping that 2013 will be a better year for everyone than 2012 was with its floods,scant sunshine and poor harvests in garden, orchard and field. What we do know however is that the Parish Hall has some treats in store for you, which we hope, will brighten your horizon and bring some cheer to the spirit! As most of you will know regular events are held at the Hall but newcomers may be interested to learn what the“fixtures” are - they would be warmly welcomed at any of them. We are lucky that Clayhidon Hall is the venue for the Upper Culm Valley’s Villages in Action programme. Despite Mid Devon District Council’s decision to cut its funding to V in A, the “shows can go on” at least in the short-term, helped by the allocation of £1,000 grant from our County Councillor Ray Radford. So we are particularly delighted to present two events that I know will be top rate as I’ve had really positive first-hand feedback from other schemes that have hosted the shows. Introducing two modern day Mario Lanzas performing some of the world's most romantic music, in a range of music from opera, swing and showstoppers. The Opera Dudes comprise a posh former Cambridge scholar and an ex-builder turned international operatic tenor. Tim Lole and Neil Allen combine their musical and vocal pedigrees with an injection of humour and charm. Don’t be surprised to find your feet tapping, your sides splitting and your heart breaking. Neil and Tim always go the extra mile to ensure their audience has a great time. I have had great feedback about this show from touring schemes as far afield as Cumbria, Hereford and Oxfordshire; it’s certain to give the audience a feeling of warm well-being much needed in mid-winter, as its one of the funniest and most entertaining shows that you can see. Newark Palace Theatre Review: “Great singing, great fun and great entertainment; these guys should be on prescription”. Tickets: Adults - £8; Concs - £5.50; Family (2+2) £24; Interval Refreshments: Sweet/Savoury & Hot Drink £2.50. Doors & Licensed Bar open @ 6.45pm + Raffle in aid of hall funds. "Femmes Fatales” with Songs for the Fallen, Wild and Wicked from the highly acclaimed jazz vocalist Sarah Moule and pianist Jenny Carr on Friday 15 March at 7.30pm. This new show combines music with theatre and celebrates the Femme Fatale in all her feisty glory as heroine, heartbreaker, rule-breaker and role model from Cleopatra and Mata Hari to the Film Noir and the Suffragettes. Although it contains nothing dangerously saucy, it is aimed at adult audiences who have variously described it as “compelling”, “empowering” and “highly original”. Tickets: Adults - £8; Concs - £6; Family (2+2) £24; Interval Refreshments. Some folk may know that Churchinford is a host village for the Somerset touring arts scheme Take Art. Charles Dickens’ favourite novel, is brought to stage with all its dark comedy by Mad Dogs & Englishmen in this fast-paced and faithful adaptation. The talented cast of two captures the hilarity and pathos of Dickens’ writing with finesse, depth and ingenious dexterity in this compulsive piece of theatre. And last – over the Hills, V in A at Awliscombe. It’s great that more people are using the badminton facilities at the Hall; one group of 4 friends has a weekly booking but there is plenty of opportunity for others to do so too. Special Deal Season Tickets of three months duration for only £30: unlimited sessions of 1½ hrs duration for the ticket holder & playing partner, family or friends. Also available are single session bookings @ £7.50. Bookings are subject to availability which should be checked with the booking clerk, Caroline Bendle; Tel: 01823 681 047. The Hall is available for private hire at the very reasonable rate of £8 per hour inclusive of use of kitchen facilities and heating. Bookings should be made with Caroline Bendle Tel: 01823 681 047.